StorageWorks believes that good design done well can make a difference in the world. We want to design products in a way to help you declutter like a ninja and transform chaos into order. All our products have been mama tested, and gently and responsibly crafted in China. Feel free to contact us if you are happy or unhappy with our products, or just simply wanna ask questions. Please note: the accessories and props in the pictures, such as clothes stored in the boxes, are used for showing usage scenarios only and are NOT SOLD TOGETHER with our product. 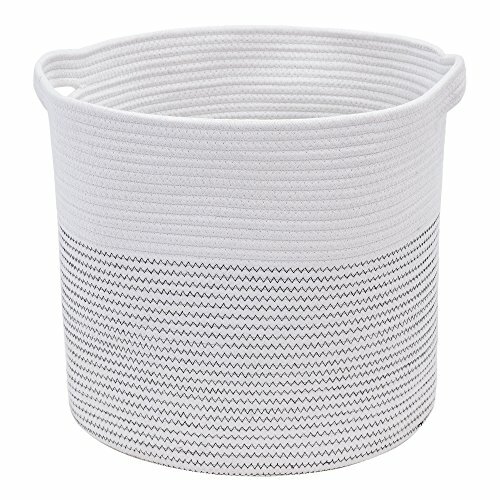 SAFE FOR YOUR CHILD: This baby storage basket is made of soft cotton rope that is gentle to the touch. SLIT HANDLE DESIGN: Allows you to easily carry our baskets around the house while avoiding heavy wooden handles that could endanger your child. COMFORTABLE SIZE: This spacious cotton storage container can hold your toys, towels, art/craft supplies, clothes and more.14.5(DIA)x13(H) "(Manual measurement, there may be 0.5-1 cm error). and more.14.5(DIA)x13(H) "(Manual measurement, there may be 0.5-1 cm error). RELIABLE AND FRIENDLY SERVICE: We provide 24-hour responses to your questions. If you have any questions about our product, feel free to contact us and we will provide you with as much support as we can. If you have any questions about this product by StorageWorks, contact us by completing and submitting the form below. If you are looking for a specif part number, please include it with your message.